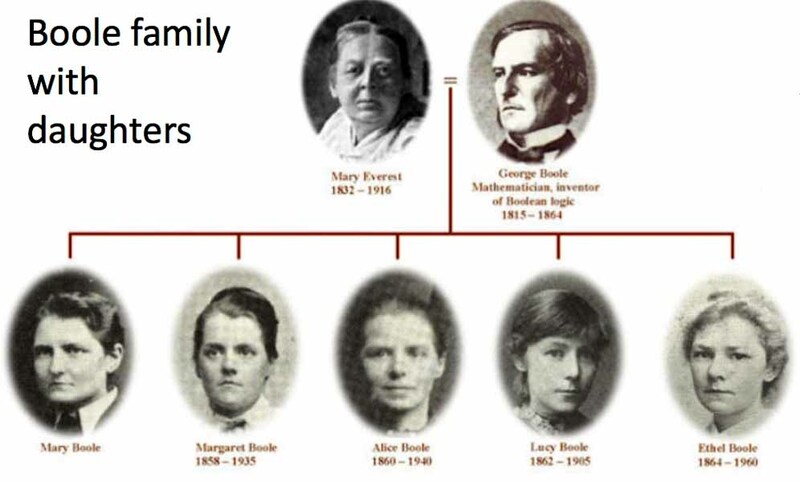 George and Mary Boole had five children, all girls. They are Mary Ellen Boole born in 1856, Margaret Boole born in 1858, Alicia Boole (later Alicia Boole Stott) born in 1860, Lucy Everest Boole born in 1862, and Ethel Lilian Boole born in 1864. All were born in Cork, Ireland. George Boole died in 1864 and Mary Everest Boole moved to London. In December 1866 Mary Everest Boole writes to Charles Darwin giving 43 Harley Street, London as her address. All five children are living at 45 Harley Street, Marylebone, London. There are another six women in the house all aged between 16 and 30. The Boole girls give their relation to the head of the house as daughter, but the census had misinterpreted this since one assumes the head is their mother who is living with her uncle Robert Everest in Sunninghill, Berkshire, at this time. All five Boole girls are described as "Scholar at College." The two addresses, 43 and 45 Harley Street have been put together and must form a large single unit housing people associated with Queen's College, London. Mary Ellen Boole married Charles Howard Hinton on 21 April 1880 in the Parish Church, St Marylebone in the presence of Charles Boole (George Boole's brother) and Margaret Boole (Mary Ellen's sister). The marriage was performed by G J Everest, Curate of St Johns, Margate. This is George John Everest, Mary Everest Boole's brother. Mary Ellen Boole is now Mary E B Hinton, living with her husband, a school teacher, at Stockerston Road, Uppingham, Rutland. Margaret Boole is living with her mother Mary Everest Boole at 103 Seymour Place, Marylebone, London. 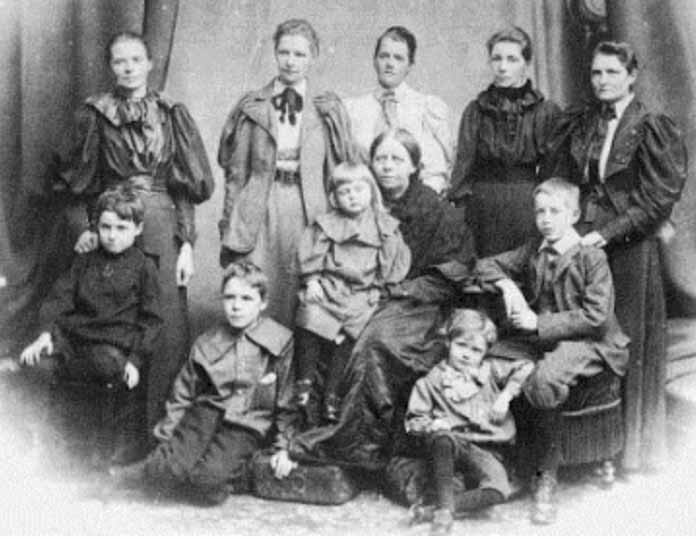 Mary Everest Boole is described as 'head of the household". Margaret is described as "Art Student (Painting)" while Mary's occupation is given as "Civil Service Pensioner". Alicia Boole is described as "visitor" at the home of Charles H Hinton and his wife Mary Ellen Boole Hinton at Stockerston Road, Uppingham, Rutland. Lucy Boole is living at 21 Elm Grove, Hammersmith, London and is described as a scholar. Ethel Lilian Boole is at 166 The Grove, Camberwell, London. Described as a Teacher of Music. Margaret Boole marries the artist Edward Ingram Taylor in Marylebone, London. Their son is the mathematician Geoffrey Ingram Taylor. Alicia Boole married Walter Stott in 1890. Mary Boole is at Station Road, Teynham, Kent. Mary Everest, her mother, is head of the household. Rather strangely, she describes her relationship to Mary Everest as "visitor". Also in Station Road (next door) is living Mary Boole's brother George Everest, curate of Teynham, Kent and his wife Susan. Mary is described as "living on her own means". Margaret Boole Taylor is living at 10 Blenheim Villas, Marylebone, London with her husband Edward I Taylor, the famous artist. Their son Geoffrey Ingram Taylor (age 5) and son Julian Taylor (age 2) are living with them. Alicia Boole Stott and her husband are living at 45 Carrington Place, North Toxteth, Liverpool. Both she and her husband, an actuary, are described as lodgers in the home of Ann Owens, her daughter and granddaughter. Lucy Boole is at 103 Seymour Place, Marylebone, London, described as an analytical chemist. She claims to be the daughter of the head of the house which seems to have been misinterpreted. Ethel Lilian Boole is at Wild Heath Farm, Golders Hill, Hendon, Middlesex. Described as visitor, journalist translator. Mary Boole is living at 16 Ladbroke Road, Notting Hill, Kensington, London. She is described as "living on her own means". Margaret Boole Taylor is living at 48 Blenheim Terrace, Marylebone, London with her husband Edward I Taylor, the famous artist. Their son Geoffrey Ingram Taylor (age 15) and son Julian Taylor (age 12) are living with them. Alicia Boole Stott is living at 4 Grasmere Drive, Wallasey, Cheshire. Lucy Boole is in Cranham Sanatorium, Cramham, Gloucester. Described as a patient and a teacher of chemistry. Ethel Lilian Boole is married to Wilfred Michael Voynich, a Polish author. They are living in Great Russell Street, Bloomsbury, London. Ethel describes herself as a novelist. Lucy Boole dies aged 42. Margaret Boole Taylor is living at 48 Blenheim Terrace, Marylebone, London with her son Geoffrey Ingram Taylor. Edward I Taylor is not at this address at the census. Alicia Boole Stott is living at 155 Withens Lane Liscard Cheshire with her husband with her children, Leonard Boole Stott (a medical student) and Mary Boole Stott. Ethel Lilian Voynich is living with her husband at 37 St Peter's Square, Hammersmith, London. She describes herself as a 'novelist working at home'.